Although he’s had some trying times adapting to the rigours of the Premier League, Ruben Neves’ upturn in form has once again underlined his undoubted importance to Nuno Espirito Santo’s well-drilled Wolverhampton Wanderers outfit. Having won four of their last six, including wins over Liverpool, Leicester City, West Ham and Everton, Neves’ contribution towards these results has been very positive indeed. Producing one of his absolutely smashing trademark finishes in the Liverpool contest and supplying a magnificent assist for Diogo Jota vs. Leicester, these two passages have drawn the headlines. But the silky-skilled Portuguese international’s contribution has extended far beyond these magic moments, however. 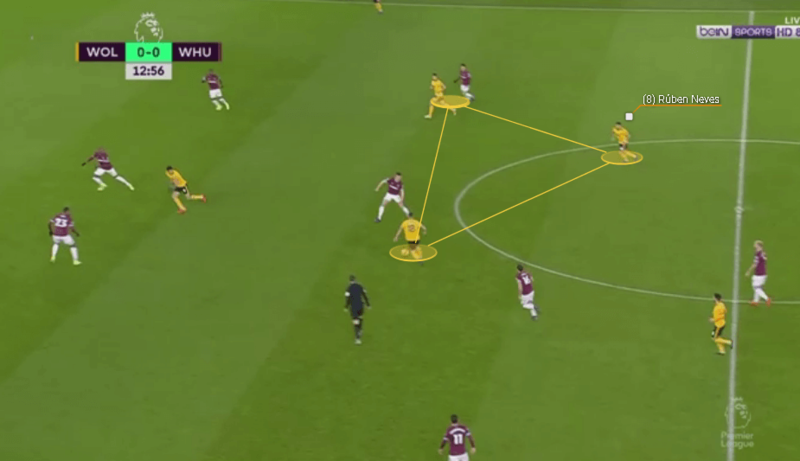 Organising and facilitating so much of Wolves’ build up play, he’s been the catalyst for so many of Wolves’ most dangerous attacks as a result of his immaculate passing and understanding of space. By keenly observing his surroundings, he shrewdly identifies where usable spaces are present so he can provide an option. A master at moving into strategically beneficial zones, he excels at creating numerical, positional and qualitative superiorities to help his team bypass the opposition. Working hard and smart, whether dropping deep alongside his central defenders, positioning himself in the half spaces or in true central midfield locations, his presence has been vital. Supplementing the aforementioned with his magnificent passing, the deep-lying playmaker’s wonderful range has been a joy to watch and so instrumental towards Nuno’s men being able to progress through the thirds. So well balanced and possessing flawless ball striking technique, Neves executes his passes with unnerving precision, for the most part, over a variety of distances. Capable of destabilising defences in so many ways through his aptitude in this regard, his incision and creativity always poses a threat to any defensive setup. 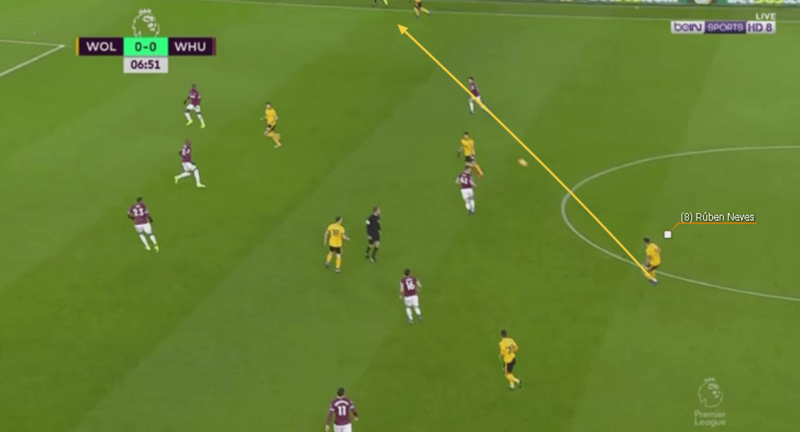 His customary fizzing diagonals have been a real feature, where he unleashes these crossfield passes to ensure his winger or wingback can enjoy an advantageous 1v1 on the underloaded side of the pitch. eficiary of late, and Neves gave a key insight into the relationship he has with his countryman. “We have played ­together for a third year so I know Diogo very well,” he explained. “I know the movements that he wants to do and likes to do. It makes things ­easier for us. He knows as well how I play and how I see the game, so he ­expects the balls. I hope he can score more now, everyone wants to score and to help. It is a part of my job, I always try to do my best,” said Neves. See also: Player Analysis for Wolves’ Helder Costa. Showing excellent vision and poise, he also switches the angle of attacks quickly, partakes in crisp combination play and knows when the time is right to slow things down or recirculate possession, recognising how crucial the latter two can be in terms of provoking pressing actions by their opponents to manufacture space further upfield. Processing situations so quickly and making sound choices, his decision making has been very strong indeed, which has been helped by his sharp control and how he calmly handles being pressured to still complete his actions despite being under duress. Weaving away from danger artfully, his dribbling, plus his subtle array of feints, shimmies and razor-sharp turns, has vitally afforded him separation from his man while he picks his options. Operating with such intent and loving working under Nuno, he’s comments on his team’s philosophy sum his and his team’s approach up suitably.”We want to play every game like it the last game of our lives. It’s our job. You can’t think about what you’re going to do in the future until you’ve done things in the present,” he noted. The set piece specialist’s offensive numbers aptly demonstrate his worth, with him completing 86.3% of his 57.65 attempted passes per game, 9.14 accurate passes into the final third pg, 4.46 accurate long balls pg, 1.94 shots pg and 0.68 shot assists pg. With Neves back steering the ship and now looking right at home in the Premier League, it’ll be expected both he and Wolves will keep up their impressive momentum into the final third of the campaign. How will things work out for Ruben Neves and the rest of Wolves coming into the finish line of Premier League? Support Ruben Neves when placing your Premier League bets at Eastbridge brokerage’s Skype Betting service or through VOdds betting platform!